TESI may from time to time need to interrupt service to make necessary repairs and perform necessary maintenance to our systems or connections. Sometimes repair and maintenance is planned and scheduled in advance and advance notice will be posted below. 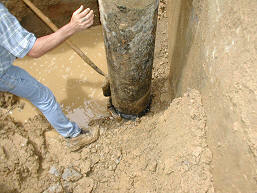 Unfortunately, there are times that necessary repairs are unforeseen and unscheduled emergency repairs. Notice of Unscheduled Emergency repairs will be posted below as they occur. Please rest assured in knowing that our service personnel are on call 24 hours a day, 7 days a week, 365 days a year and trained to respond quickly to complete any unforeseen emergency repairs. We make every effort to complete repairs and restore your service as quickly as possible. If you are experiencing a service issue you can check the Service Alert Listing below to see if there are any Service Alerts in your service area. If you do not see a current Service Alert Posting for your area then please call your branch office and promptly report any service issues. If you have any questions or concerns that are not addressed in the Service Alert Posting then please call your branch office. TESI has received notice from the lab that the tests taken are negative and the precautionary boil advisory has been released/rescinded. If you have any questions, please call 800-372-9712. Thank you for your patience in this matter. TESI HAS COMPLETED THE FLUSHING IN YOU AREA. THANK YOU FOR YOUR PATIENCE WHILE WE WORK TO MAINTAIN THE HIGHEST QUALITY. IF YOU HAVE ANY QUESTIONS OR COMMENTS PLEASE CONTACT CUSTOMER SERVICE AT 800-372-9712. FLUSHING OF THE NEW WATER MAIN WAS COMPLETED. If you should have any issues/concerns, please report them to TESI at 800-372-9712. Thank you very much. The boil advisory issued last week has been lifted. You may resume normal consumption and use of your water. Thank you for your patience and if you have any questions, please call 800-372-9712, ext3025. Beginning 9/5/13, customer service office hours are 8a-1p 1:30-4:30p Monday-Thursday and 8a-1p 1:30p-3:30p on Fridays. Customer Service is closed for lunch between 1p-1:30p everyday. Thank you!